Starting with V8.7, Flowtime uses a new theme: Cora. You can customize the new theme using two sets of variables: one that changes the look and feel of the Flowtime website and another that changes elements in task forms. CustomPortalVariables.less Includes variables that change the UI elements in the Flowtime website. CustomWorkflowsExplorerVariables.less Includes variables that change the elements on the left panel and top menu of form pages (marked in red in the screenshot on the left). From the Shared Resources folder, open the PNMsoft.Sequence.Web.SharedResources.Themes.csproj located in the Shared Resources folder. Note: Open the file using Visual Studio with the Web Compiler extension. Add or edit the required variables in the relevant file: CustomPortalVariables.less or CustomWorkflowsExplorerVariables.less. For a list of the most common variables, see the article Flowtime design variables. You can run a Preview.html file to view how your changes affect Flowtime UI elements. Go to <server name>\Program Files\PNMsoft\Shared Resources\Themes\Cora, and open the Preview.html file. Preview how your changes affect the Flowtime UI. The Preview page displays labels with the names of the variables next to the UI elements controlled by the variable. To show or hide the labels, click Show Variables. The Preview file works only with the Cora theme. Preview is available only for the New Process and My Tasks pages. If Flowtime is installed in more than one server, you can copy the changes you made in one server to the other one. On the server where you made changes to the Cora theme, go to C:\Program Files\PNMsoft\Shared Resources\Themes, and make a copy of the Cora folder. Paste the copied Cora folder to the same location, C:\Program Files\PNMsoft\Shared Resources\Themes , on the target server. 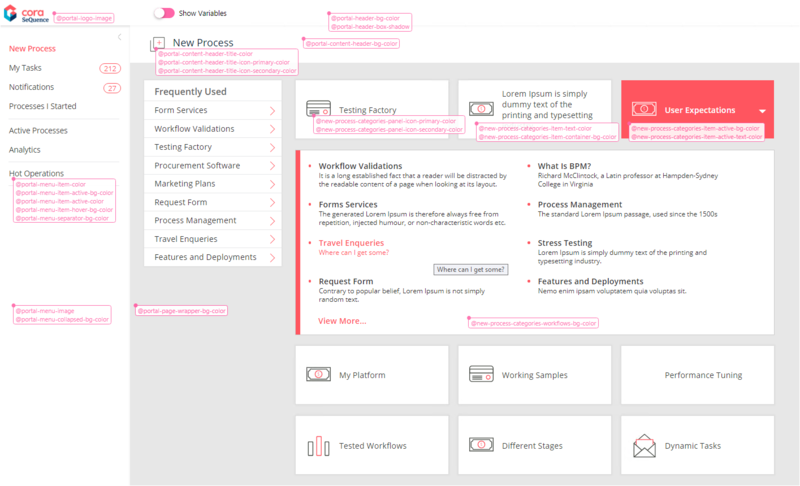 In the Cora theme, the New Process homepage displays a list of workflows instead of categories, but systems that upgrade from previous versions still display categories. When you set up a workflow in the Admin console, you can select an icon to display next to the workflow name on the New Process page. In the App Studio, click the workflow canvas to show the workflow's Properties panel. Under UI>Icon, click the ellipsis button. From the Select Icon screen, click the icon that best fits your workflow, and then click OK. The icon displays next to the workflow name on the New Process page. You can select an icon to display at the top of a Flowtime page. Go to the Flowtime application's folder, and open the ASPX file of the page to which you want to add the icon. Set the value of theIconIdparameter to the name of the icon. <sq:UserMessagesGridControl ID="UserMessagesGridControl" PageSize="20" DisplayVariables="true" ConfigName="Portal"
For a list of all the available icons and their names, see this article. Restore the backed up files to the Cora folder at C:\Program Files\PNMsoft\Shared Resources\Themes\Cora. Open the LESS files in the Visual Studio with a WebCompiler extension, and save them.